The wall that went up near Oakley and Arden roads. Neighbors are upset that it was built without informing them, and say it has caused flooding on some properties. 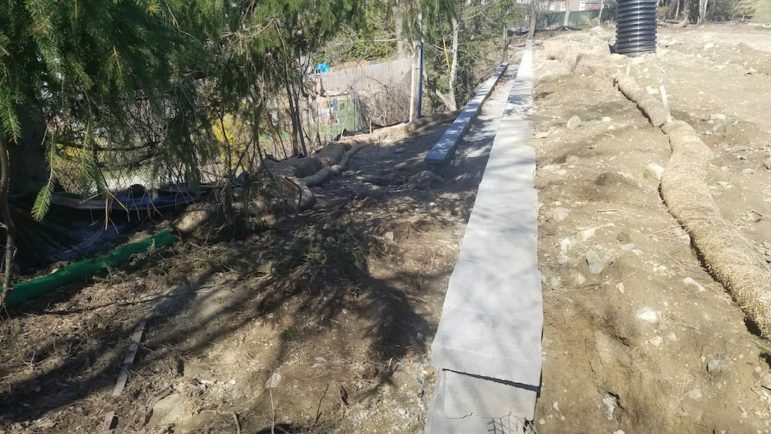 A project that erected a wall at the back of Oakley Country Club, and facing a nearby roadway, has drawn criticism from neighbors for pouring water into the area after storms. Oakley Country Club officials said that the project, when complete, will actually remove most of the runoff from that part of the golf course. Jack Bartley, president of Oakley Country Club, said he believes the project will benefit the neighbors, but added that the club could have handled the project better. 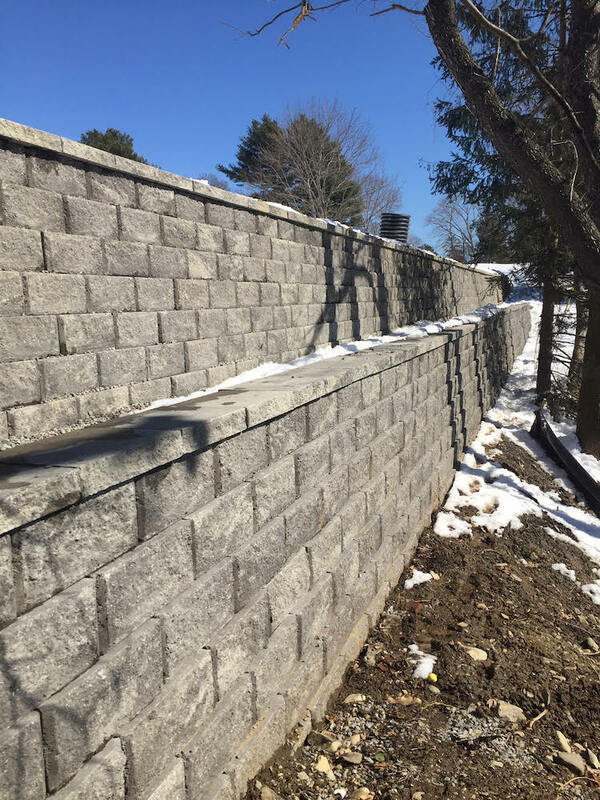 The wall that was put up by Oakley Country Club as part of a drainage project. Neighbors say it has caused flooding in big storms, but Oakley officials say the project is not done, and will help drainage when complete. Work on the project, however, was stopped by the Town on April 12. While the plan for the drainage was approved by the Town, the project includes a wall more than 4 feet high. That also requires a building permit, which the project did not have. The project has been scheduled to go before the Zoning Board of Appeals to get a change in the special permit. Oakley also wanted to install an irrigation system to water the grass on top of the newly renovated area, Bartley said, but Town officials did not approve that part of the plan. Historically, water has drained off of the golf course at the location, which is uphill from the homes on Arden Road. 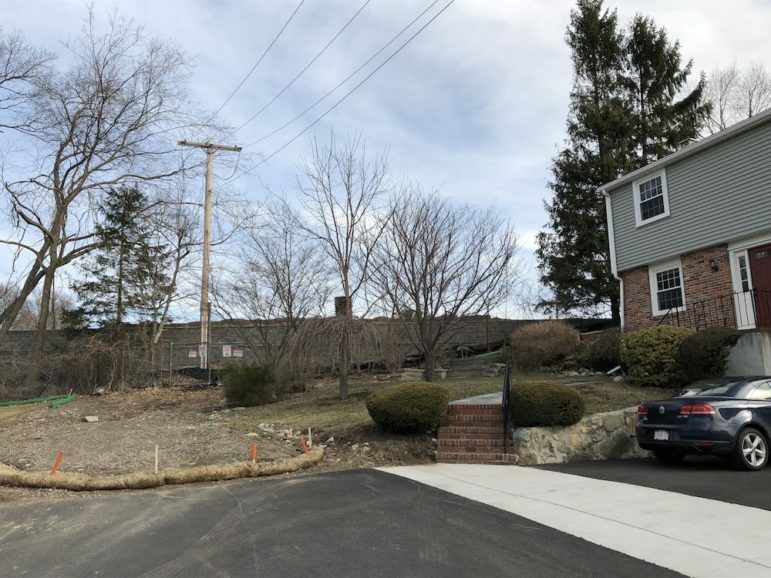 Before the project, the land sloped from the top of the hill to the street level. The project is designed to capture the water in the storm drainage system, said Oakley Golf Course Superintendent Pat Lange. “This project will stop a huge portion of the water from going into people’s yards,” Lange said. A view along the top of the wall at Oakley Country Club. Water will drain into the large black pipe (which will be cut to ground level). The area will be landscaped when completed. The land will be pitched so that water is funneled into a large drainage pipe, and down into a 500-gallon underground tank before going into the Town’s storm water system, Lange said. Behind the wall is an area of gravel, five-feet deep, which will help drainage, Langue said. New landscaping will be planted to block the view of the wall from the street, Bartley said. Images of major runoffs have been captured by residents after the spring melt and during a heavy rain on April 15. Lange said part of the problem is a blocked storm drain grate on a right-of-way owned by the Town of Watertown. 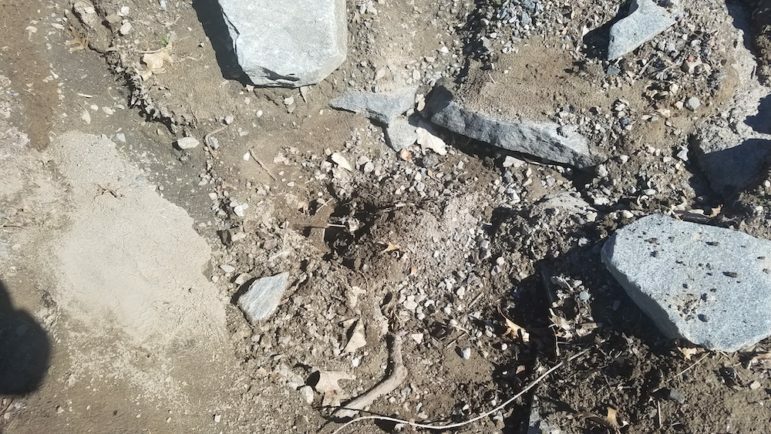 “I uncovered it and put in silt fabric to stop that stuff from getting into the town’s system and clogging it up,” Lange said. Lange said he believes the drainage grate was covered over during work on at a nearby home. A drainage grate had been covered over, adding to storm runoff problems on Arden Road near the Oakley Country Club. Lots of neighbors are also concerned about your recent drainage work on the Bellevue Road section of your property. The drainage system you have been working on this year seems to have directed water from what was once a wooded wetland area and down into the grassy area on your side of the fence. Once there, the ground saturates and water slowly seeps under the fence into rivulets down into the gutter. It’s not apparent that any such underground tanks were installed here as on Arden. It sure would have been nice because the storm drain on your side of Bellevue bears a much heavier burden now and so do our basement sump pumps. We don’t really like thinking about the phosphorus fertilizer that this runoff probably carries to the Charles River, either. Oakley worked with an “expert” and that individual did not think that a permit was necessary. That is either a crock or the so called expert is plain incompetent. The sign outside the original Frank Pepe Pizzeria Napoletana in New Haven, Conn. Watertown residents will be able to get pizza from one of the most famous pizzerias in the nation when it opens at the new Arsenal Yards project. A mother helps her son collect eggs at the Perkins School for the Blind Beeping Egg Hunt. The following piece was provided by Perkins School for the Blind: Hundreds of children and extended family members joined in on the 7th Annual Beeping Egg Hunt at Perkins School for the Blind on Saturday, April 6th.